On one of our recent trips to Sant Sadurni d’Anoia we finally managed to visit Rimarts. We have been very fond of this producer of cava for a long time and we are of course ecstatic to be able to add them to selection of wines that we are now making available to our customers in the Nordic countries (see here for our current range). Rimarts is a family operation to the core with the two brothers Ernest and Ricard running the business that their father Ricard Martínez de Simón started. The business is also named after him. The idea for the founder was to produce high quality cavas using true craftsmanship. Father Ricard was convinced that it is vital to control every step of the production process and that the best way of doing that, and ensuring a high quality, is to do as much as possible by hand. Most of the equipment used today is the same as it was when the business started so it is a really nice experience to tour through the small facilities. Ernest showed us around the full production and even showed us how to disgorge and cork (remove the temporary cap and put in the natural cork) a bottle by hand. It is a pretty impressive process and I am sure that I would not be able to do it as nicely as Ernest. He reveals that there is however a lot of practice behind his talent. Ernest explained that when he and Ricard were kids they were always upset that they had to help with the production and were not allowed to be out and play as much as they wanted. Today they (and we) are happy that they were made to practice as much as it enables them to produce this great cava. Today Ernest and Ricard are the ones mostly involved in the business but their mother and their single employee also helps when it is time to disgorge and bottle. Just imagine, your bottle of Rimarts being stacked, turned and corked by hand. This process is done upon order. The philosophy behind production is the same today as when they started production in 1987. They want to satisfy the most demanding palates around the world. Rimarts strive to respect natural processes, and they have an ecological approach to the production. They also apply a lot of patience in the production and rather age cava a bit longer to improve the taste and provide maximum expression. The cava is ready when it is ready. As Ernest told us, the passion for the land and the fruit combined with their knowledge of the craft of making cava is what goes into each bottle. They are however not strangers to innovation as for example the Rosae cava shows. It is a most unusual cava that has a bit of smokey flavor – it is like nothing I have tasted before, developed together with a Michelin-starred chef. Interesting and great with some jamon or perhaps even with smoked fish. We have sampled the full range of cava and from their entry level (the Rimarts Reserva 18) up to the most premium one (the Uvae) they are all fantastic wines. It is hard for me to pick a favorite as I think these are all good cavas but the Rimarts Gran Reserva 40 is perhaps my (and S’s) favorite one. It has bright gold color with very fine, persistent bubbles. Aromas of ripened fruit, notes of ageing, toasted nuts mix with hings of yeast and brioche. Perfectly balanced with a long and pleasant finish. For me it also show cases why cava is a perfect match with lots of food and also shows that the best cavas can compete with almost all other sparkling wines around the world. I will happily have a Rimarts cava for any occasion.. 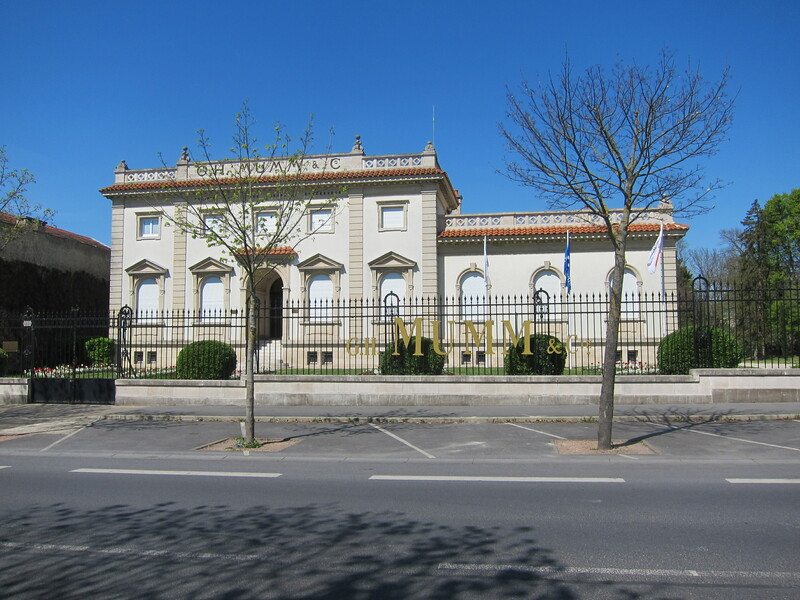 While in Reims, we took up the opportunity to do some tours at the big champagne houses. Perhaps if it would not have been a Sunday or we would have had a car, we would have opted for something different; something more personal. However, with the restricted availability we opted for G.H. Mumm. The Gordon Rouge is one of the first champagnes I have tasted and we have rather liked the blanc de blancs, Mumm de Cramant. We also visited Mumm Napa while in California and remember it being, “ahem”, let’s call it a cheerful experience. A surprise glass with an aroma set. 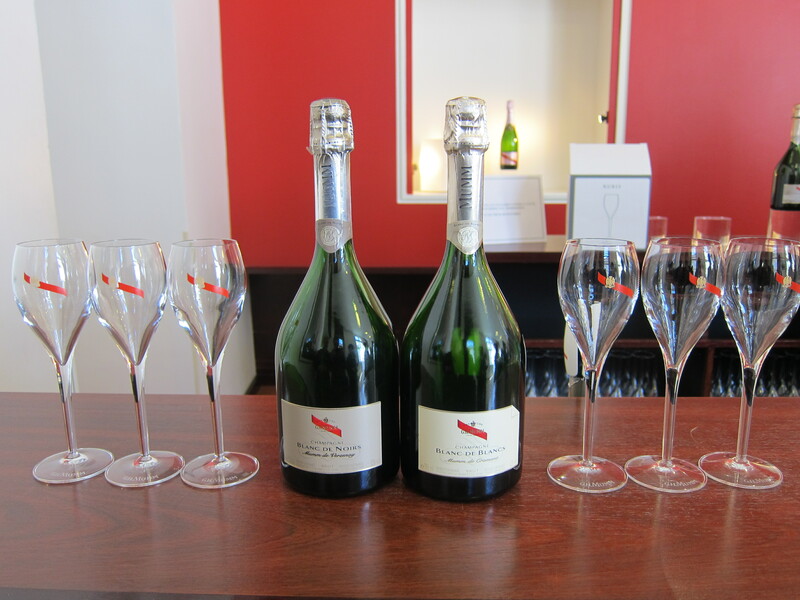 The “Black and White” experience with two glasses of very different Mumm champagnes to compare different grapes: The Blanc de Blancs and Blanc de Noirs. We were not that interested in the Gordon Rouge, nor was the surprise option very inviting from a control freak like me. So we chose tasting number three (3). The price was also a nice surprise, 25€ instead of 39€, as our hotel (Mercure Cathedral) had a significant discount for all of the tasting experiences. Sweet! The tour started off from the cellars from the process steps when the grapes had already been pressed and made into wine. The guide explained the first and second fermentation, mixing of the wines and the removal of the yeast after maturation. She explained the process of quality control and “dressing”, labeling of the bottle. A fairly comprehensive introduction into the making of champagne. To our (mine and Ms) disappointment, we did not see much production equipment, however the guide used the help of pictures and videos to describe these parts. As it was a Sunday we also were not able to see the people at work at the cellars. Next time I will definitely come on a weekday. The tour ended in the tasting room, where our glasses were already being poured. After spending some time in the humid cellar, the glas(ses) of bubbly felt very welcome. Even though I was not that enthusiastic about the surprise tasting, I was a little bit jealous when I saw what they were having. I guess I just expected the organizer to cheap out, but they had selected a decent bottle, a Vintage Mumm from 2006. They also had a few snacks, and seeing them made me increasingly hungry. The Black and White tasting was of course good, but the blanc de blancs I was already familiar with (review here), so it was more the 100% Pinot Noir that I was curious about (review here). After the tasting we headed for the shop. This was perhaps the most disappointing part of our tour, the selection was just plain boring. I was hoping to have the opportunity to browse some vintages and perhaps see some rarer bottles, but the “factory shop” was nothing of the like. The selection consisted mainly of the Gordon Rouge and a few other bottles: the 100% Chardonnay and 100% Pinot Noir that we had tasted earlier. Additionally one could buy some Mumm labelled accessories. Even though the tour was not perfect, it was in line with our expectations. We got what we came for which was to hear more about the producer and see the cellars. So if in Reims, G.H. Mumm is not a bad option for an activity. Kids were also welcome, so it is a great opportunity to have some family fun.